Although he wasn’t personally motivated by competition, his championship medals and international connections ushered in a new respect for U.S. eventing. Sitting on the floor of his family’s living room in Pelham, N.Y., a quiet suburb of New York City, Michael Page, then 15, dreamily flipped through an issue of Light Horse magazine. 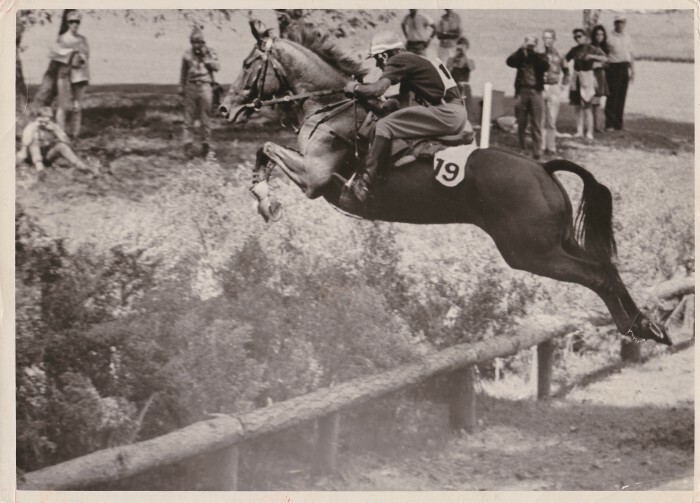 Photographs captured horses and riders elegantly clearing jumps, alongside reports of international competitions. With each turn of the page, the teenager became more enthralled. His father, Homer Page, sat in an adjacent chair, equally engrossed in his Sunday newspaper. Suddenly, he put it down and asked his eldest of five children what had so captured his attention. He wasn’t surprised to hear it was an equestrian magazine. Homer had observed how his young son would become transfixed whenever a show depicting horses came on their television. Likewise, he’d witnessed Michael riding his bike 12 miles to the nearest barn where, at first, the budding equestrian climbed into the straight stalls, hopping from horse’s back to horse’s back down the length of the barn, and then later took lessons. Homer recognized this wasn’t a passing fad for his son, this inexplicable draw to horses no one else in their family shared. And he knew quite a bit about inexplicable passions and the magic in pursuing them. He’d chased his own as a young man, deviating from the expected path to an Ivy League institution like his siblings and instead traveling to Europe to become a Shakespearean actor. Homer would turn away from this dream when adult responsibilities intervened, and he returned to New York to run the family business making hat liners at Beatty-Page Inc., based near Washington Square Park in Greenwich Village. So, on that afternoon in 1953, Homer did an extraordinary thing. He instructed his teenage son to write to a handful of barns advertising in the back of the magazine to see if one could provide a formal equestrian education. “He suggested that instead of going to camp over the summer, why didn’t I go to England and start getting an education in classical riding. He said, ‘You need more education. You need more experience. I, obviously, can’t do anything for you, so go where you can learn it. It costs the same as going to camp, but somebody has to guide you in your aspirations,’ ” Michael recalls. “That was his thing, knowing that,” Michael says. “It was remarkable. I said, ‘Wow, that sounds great!’ He understood my need to expand my knowledge beyond what he could offer me. That encouragement ignited a chain of occurrences that would eventually lead Michael to individual and team medals in three Pan American Games and to riding in three Olympic Games, bringing home medals from two and helping to secure U.S. eventers as a competitive force in the sport. But, he was never fueled by a love of competition. “I just wanted to ride,” he says. Michael Page on Foster at the 1968 Olympic Games in Mexico City. Photo by Werner Ernst. Before he found himself aboard a ship to England with his saddle and suitcase in hand, Michael was obsessed with riding. “When I was 10, I used to watch black-and-white television, and my dream was to be a Pony Express rider. The world back then was different. The cowboys—they were heroes, and that always left an impression on me, right? Then part of what I saw, the visual image, was the horse,” he says. Michael is telling me this in the cozy living room of his North Salem, N.Y., home, around the corner from the Old Salem showgrounds, down a dirt road lined with quaint stone fences. He’s lived here for 38 years with his wife Georgette (they have been together for 50 years) and raised their son, Matthew, in this charming house nestled within acres of preserved open space. Even though Matthew, now 38, lives in Washington, D.C., and works for NASDAQ, his presence is everywhere in their home with framed family photos on every surface. “He is a great kid,” Michael says as I admire one of the snapshots. Matthew, while riding as a child and traveling back and forth to Florida with his parents, evolved into pursing other sports, like golf and baseball. Michael, 78, has a habit of punctuating nearly every sentence with the word, “right?” making each statement sound more like a question as he recounts his life. It’s almost as if, even after all these years, he still can’t quite believe his luck in how his life has played out. For as fortunate as he considers himself professionally he is quick to tell me, “The luckiest thing that ever happened to me is her,” and points to Georgette, whom he met at U.S. Equestrian Team headquarters in Gladstone, N.J., in 1966 when she was working as a groom for the team. Georgette sits with us as we talk, sometimes chiding her husband that maybe he shouldn’t share that story and laughing at his jokes despite certainly hearing them repeatedly over the years. Their admiration for one another is palpable. 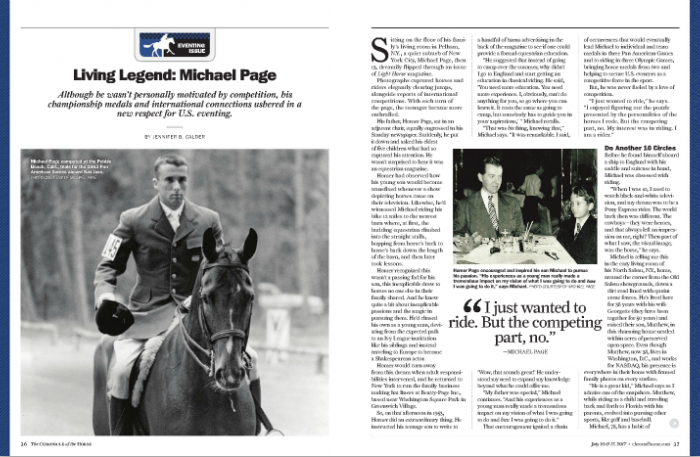 This is an excerpt from the article “Living Legend: Michael Page” by Jennifer B. Calder, which appears in the July 10 Eventing Issue of The Chronicle of the Horse. If you’d like to read the article in its entirety, you can subscribe and get online access to a digital version and then enjoy a year of The Chronicle of the Horse and our lifestyle publication, Untacked. Or you can purchase a single issue or subscribe on a mobile device through our app The Chronicle of the Horse LLC.